We invite you to stay in our 1850s solid brick farmhouse that has been completely remodeled with all the modern conveniences, including central AC, heat and high speed wifi. We live ten minutes away so can help you with whatever you need. The Farmhouse can sleep up to six people. There are two bedrooms. The master suite has a king size bed with new pillow top mattress and flat screen tv. The guest bedroom has a Queen pillow top bed that comfortably sleeps two. There's also a separate Writers Cabin with a Queen pillow top bed that sleeps two, work desk, flat screen TV, and wifi (need to use the house bathroom). We gladly provide all linens. We have a full bath upstairs with an Americast soaking tub and half bath powder room with washer/dryer downstairs. We provide all towels, soap, shampoo, and washing detergent. We like to spread out on two couches and mid century recliner in the living room. We have plenty of board games, playing cards, novels, kids books and backlogs of magazines to read. The kitchen is fully equipped with an eight person farm table and antique soapstone sink. You’ll have everything you need to cook a holiday meal, or just make coffee, toast and use the microwave for simple reheating. If you need anything we don’t have, we'll do our very best to accommodate. The house and yard have high speed WiFi access. So lounge inside to check your email, or wander outside to research bugs and birds on Wikipedia. Both flat screens are hooked up to Apple TVs. You can watch unlimited shows and movies on our Netflix account, or sign in to any of your accounts to watch what you want (NFL, NHL, HBO, MLB, iTunes, Hulu, etc). We custom designed this solid brick outdoor BBQ to double as a grill and fireplace. We love to have a meal on the Adirondack chairs while looking out over the hills and the friendly herd of cows next door. Sometimes the cows even come up to the fence to say hello. The BBQ grill then becomes a firepit so we can sit, watch the stars, and listen to the night sounds. Because our nearest neighbor is a quarter mile away, this is one if the best areas in Luray to see the Milky Way without light pollution. We have two acres of land so you’ll have plenty of room to play a game of soccer, toss the frisbee or play other sports in our equipment box. Read a book at at any of our three shaded picnic tables. Take stroll by the stream running along the property. Lake Arrowhead is just a short walk down our quiet gravel road. Maintained by the town of Luray, you can pay a small fee to rent canoes, paddle boats, or swim. If you have your own boat, it's free to put in. There's also a trail that winds around the lake for a great hike close by. We're only five miles from the entrance to the Shenandoah National Park. We buy a day or week pass into the park to drive the 110-mile Skyline Drive. Or choose from the approximately 100 day hikes (of varying difficulty) that show off the Park's many waterfalls and vistas. If you want to get 5 feet away from a deer, you'll be able to. Sometimes it's fun to eat at Skyland on top of the mountain where you can see the all of Page County below. A short drive across Luray will bring you to the river outfitters where you can rent a canoe, kayak or tube for hanging out on the Shenandoah River. A must-do activity when the weather is nice, you'll never forget the times you spend on the river. A quick 5 min drive to East Luray Shopping Center, the gym is a great place for a workout. $5 for a day pass will allow you to work out on all the machines, treadmills and use free and fixed weights. We love it there! Luray is a quintessential small American town with a number of restaurants from fancy to burger joints. Several pizza places deliver to the farmhouse. For quick needs, there's a small deli just five minutes from the farmhouse that has sandwiches, beer, snacks, and homemade donuts (only on Saturdays, they are amazing). Treasure hunt at the antique stores, or grab outdoor gear at the outfitters. The famous 6-screen movie theater, a true local treasure, is open for matinee and evening screenings. Uncle Bucks is the sports bar where locals enjoy the game (stays open late every night). Several groceries stores and Walmart will provide you with everything you need. There's also the Wisteria winery that's open most days to enjoy a local wine tasting. We are video documentarians. Since we live in a rural area, we travel often for work. We love staying in neighborhoods rather than stuffy hotels while on these work trips. And we like to cook! So our experience staying in other people's rentals has taught us what we expect to have a comfortable time. We have lovingly rehabbed this 1850s solid brick farmhouse and turned it into a modern home. The bricks were constructed on the property right after the Civil War. The house in on a secluded 2 acres with plenty of trees and views. The remodeled farmhouse has been updated with all the modern conveniences, including central AC, heat and high speed wifi. We spent three years hand picking all the furniture and artwork so you will feel at home. We live ten minutes away so can help you with whatever you need. Even in rural America, is often difficult to find a property that doesn't have other homes close by. We fell in love with the farmhouse because it's nestled in a secluded two acres. You can sit outside on the long covered porch and watch the different species of birds in the quiet. If you wake up early enough, you can even watch the family of deer that graze in our yard. At night, you're in one of the spots of the county that has almost no light pollution. The stars are as clear as we've seen. We also fell in love with the Post Civil War construction of the farmhouse. The walls are three courses thick with bricks that were made on the property in the 1850s. When we remodeled, we pulled up all the old flooring to discover the original heartwood pine planks still existed. After refinishing the floor, the wood has a gorgeous look that cannot be bought. The master bedroom is our favorite part of the house because it has a huge king size bed plus an entire suite with two leather couches, large flat screen TV, wifi, and a library. You could stay all weekend and never leave this room. But if you do decide to take a stroll, Lake Arrowhead is just a 5 minute walk down the gravel road. You can go swim for free, or use the "beach area" with a lifeguard for a small fee. You can also rent paddle boast or canoes. We like to take a long walk around the lake in the evening. When you need some action, you can drive into town and eat in one of the restaurants. Our movie is a local attraction with it's unique themed rooms. We have a speaker system that you can hook up your mobile device to play music. There's a golf course just 10 minutes away in Luray. Has a daily fee. Play golf with two miuntain ranges surrounding you. I’ve never stayed in a more fully equipped vacation rental than this lovely, fully updated 1850s farmhouse. From board games to baseball mitts, from chilled bottled water waiting for us in the fridge to dog treats for our puppy, Ryanne and Jay provided everything a houseguest could wish for. Rafting down the Shenandoah River with SRO was a perfect way to spend a leisurely day, and the beach at nearby Lake Arrowhead is ideal for any family with young children. (You can also rent kayaks or fish there!) Hiking trails in the Shenandoah National Park are among the nicest I’ve encountered east of the Rockies. I hope to return soon and often! The house and property were beautiful. We were impressed with all the amenities from books and games to baby supplies (pack-n-play and high chair). Had a fun time watching the cows and turtle nest. Gnats were bad but that is to be expected for 80 degree days in the spring. This is the perfect spot...a total retreat yet an hour and you are back in NOVA and emersed in busy civilization. We loved this well appointed- extremely clean home. The yard and grounds were so relaxing from the hammock to the fire pit to the cow parade at lunch! Such a wonderful stay! The best holiday house we've ever rented! Jay and Ryanne have done an amazing job in making their farmhouse the most wonderful place to stay! Despite the snow flakes outside, we were warm and cosy, and took full advantage of all of the fantastic goodies inside the house, which was sparklingly clean and beautifully furnished. They really have thought of everything, from indoor and outdoor games for all ages (our kids particularly loved Battleships!) and so many thoughtful extra touches......including a kettle and tea bags.....the Brits in our party couldn't believe their luck! They were extremely attentive, and made us feel incredibly welcome. We were there with family, including little kids and grandma, but it would also work brilliantly for a romantic weekend, or grown up get away in the countryside.....just perfect! Don't miss an opportunity to check it out! Our family of 4 stayed in the farmhouse for 3 nights and wish it had been longer. We have stayed in a lot of vacation rental properties, although this was the first in the US, and believe Jay and Ryanne have created the perfect vacation home. They have genuinely thought of absolutely everything you could want, from condiments in the fridge to labels on light switches! The house is also beautifully clean. 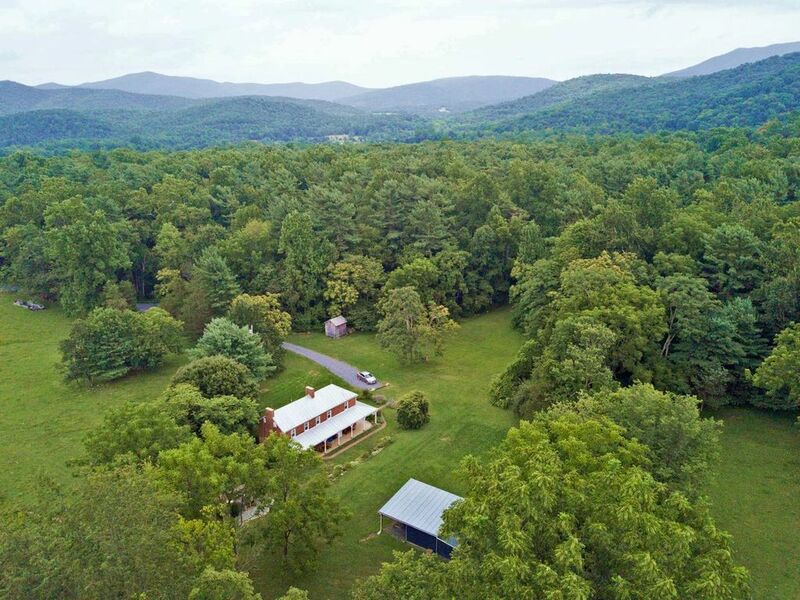 The property is in a brilliant location, close to the entrance to the national park and close to Luray for shops/restaurants etc. We enjoyed hiking in the national park and were thrilled to see a black bear. We would also recommend a visit to Luray caverns, which are spectacular. Hopefully we’ll be back to the farmhouse one day! Lake Arrowhead is just a short walk down our quiet gravel road and free to use. Maintained by the town of Luray, you can pay a small fee to rent canoes, paddle boats, or enjoy the beach area with a lifeguard. If you have your own boat, it's free to put in. There's also a trail that winds around the lake for a great hike..
A short drive across Luray will bring you to the river outfitters where you can rent a canoe, kayak or tube for hanging out on the Shenandoah River. A must-do activity when the weather is nice. You'll never forget the times you spend on the river. If you have your own boat, you can use a number of public boat landings. Luray is a quintessential small American town with a number of restaurants from fancy dining to burger joints. There's also a coffee shop w/ wifi and a local bakery making fresh goods. Several pizza places deliver to the farmhouse. For quick needs, there's a small deli just five minutes from the farmhouse that has sandwiches, beer, snacks, and homemade donuts (only on Saturdays, they are amazing). Treasure hunt at the antique stores, or grab outdoor gear at the outfitters. The 6-screen movie theater, a true local treasure, is open for matinee and evening screenings. Uncle Bucks is the sports bar where locals enjoy the game (stays open till 1am every night). Several groceries stores and Walmart will provide you with everything you need. There's also the Wisteria winery that's open most days to enjoy a local wine tasting. The Luray Zoo is on the edge of town and famous for rescuing exotic animals. Perfect for kids who want to safely get close to animals. A new hospital w/ a 24-hour emergency room is just 10 minutes away.